Opal football is back! This season promises to be bigger than ever, with a lot of returning heavyweights, and debuting (or re-debuting) teams! The North sides returned to Sheffield to stomp familiar grounds. 8 hours of football was in store as a number of teams got their seasons off to strong starts! Here’s the 5 things we learned from the action! The Sheffield Giants came into the season as one of the hot favourites in the North after a strong debut season had us excited for the encore! 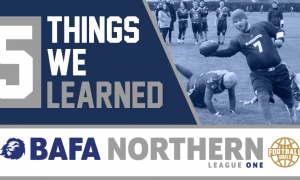 The Sheffield Giants program is one of the UK’s more successful institutions, as they entered two teams in the BAFA mixed division last year. 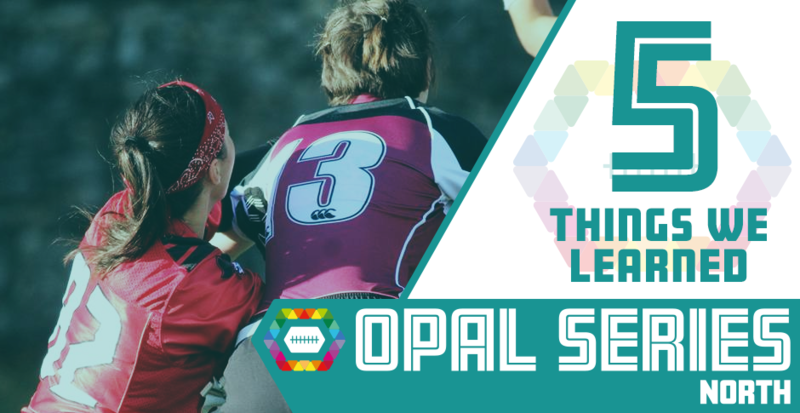 Their development side, the snappily titled Sheffield Giants 2, gave valuable game-time to a number of the Opal cohort. You couple that with the offseason acquisition of GB Lion Marta Mathews, then you’ve got a ridiculously loaded offence who have obviously improved on last year. Emma Bowman had a terrific day spreading the ball around to her receivers, as no-one could slow the Giants down. Defensively, HC Dean Whittingslow employed his best athletes in pivotal roles as they pitched four shut-outs. This athletic Giants side is looking primed for a potential title run after a 4-0 start to the season. 282 points scored and 0 conceded are some frightening totals. There’s not much to delve into with the Giants, other than they look damn good. The top two sides in the North from last season show little signs of slowing down. On a game-day where they avoided each other, the Pirates matched the Giants’ 4-0 record, but didn’t quick match the point total, with 217 of their own, conceding 7. A number of the East Kilbride Pirates ladies have been suiting up for the Glasgow Killer Bees during the BAFA mixed season, and have picked up some valuable experience, much like the Giants women. Their wins over the Hallam Rangers and Nottingham Green in dominant fashion were entirely expected, but we saw some Jekyll and Hyde in the other contests. The Hyde of the day for the Pirates was their 20-7 win over the well-drilled Nottingham Gold side. While it was still a strong win, it has set them firmly behind the Giants on points difference. The offence struggled for consistency, while the defence showed some cracks on a Nottingham scoring drive. All in all, the Pirates were knocking the rust off, but their game against the Giants at the next game-day could be a real marker for how their season will pan out. 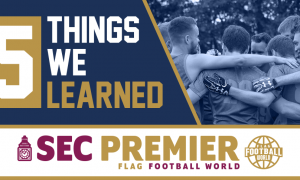 While the Hallam Warriors took two hammerings at the hands of the Pirates and Giants, they’ll be delighted with their output on the first day of the season. 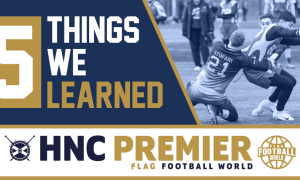 The heavy losses aside, they had two comfortable victories over the Manchester Titans and Chorley Buccaneers, both of whom will be fancying themselves as playoff sides. As mentioned previously, the Warriors had returning a number of supremely talented players, such as Katie Lobo, Rachael Carnduff and Steph Tharme for this game-day. For these university sides, continuity is massive. The earlier start to the season has somewhat hurt the recruitment of Warriors and Rangers, so with a potential injection of some new talent, we could see the Warriors separate themselves from the chasing pack. From our understanding, there’ll be a number of trials and open days in store for new recruits and existing members of the Sheffield Hallam program, so we could see two very different sides at the next game-day! For the Warriors to return to the playoffs, this season will be all about concentrating their efforts on winnable games. Saturday was a fantastic start! The Buccs and Titans both went 3-1 and, with the Buccaneers ahead of the Titans by virtue of points differential. Both sides had the same schedule and delivered the same results, with the pair taking down the Nottingham Gold and Green, as well as the Hallam Rangers, before losing heavily to the Hallam Warriors. The Buccaneers look similar to the side from last season. They’re a side with solid fundamentals and discipline, which can frustrate some opposition. This was a recipe for success last season as the Buccs made the playoffs at the first time of asking! As for the Titans, their re-debut in the Opal Series saw them look very different from the last time we saw them, but with solid coaching from the sideline, we expect that lop-sided losses such as the one against the Warriors will be few and far between this season. They’ve got experience in their midst as defensive captain Julie Gilmour previously suited up for the Pirates – she snagged an interception for her side as they put themselves firmly in the playoff hunt. We’re anticipating a season of ups and downs for both sides, as they’ll both be competing for that final playoff position. Overcoming the strong Warriors might be a bridge too far this year. The Nottingham University program chose to enter two teams again into Opal this season, as they saw a large amount of player turnover, as expected. Similarly to the Hallam sides, their recruitment may be stunted by an early start to the Opal series, but that didn’t stop both sides putting in spirited efforts. The aforementioned 20-7 loss for the Gold side to the Pirates was an eye-brow raising scoreline, as the Nottingham outfit held firm for much of the game. Both the Titans and Buccaneers secured narrow wins over the Gold girls, showing that Nottingham might not be as far behind the pack as you might think. The Green side ran the Titans close, losing by only 6 points in the end. They’ll get another crack at the Titans at the next game-day!